Taking Your Back To The Next Level! As a powerlifter, it sort of shocked me, as I never dreamed of being a bodybuilder. 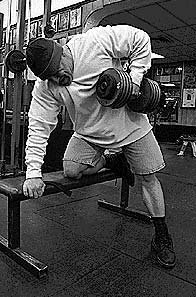 So I will go ahead and lay out a good back routine that will help the bodybuilder take it to another level! 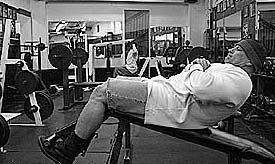 At the 2005 Arnold Classic Expo, I was privileged to be able to do a seminar in The Cage. I forgot my chalk, so it put a crimp in my plans to haul up an easy 750 deadlift. Thanks to the mayhem the crowd produced, I was still able to deadlift a real easy 700 in long Dickies pants, totally raw, with no chalk. I was very happy with that pull. Now I was asked by several bodybuilders about my back development at the show. As a powerlifter, it sort of shocked me as I never dreamed of being a bodybuilder. So I thought I would put into writing my back routine. If I can build a back like this concentrating on strength, then bodybuilders can take it to an even higher level. 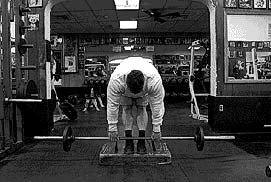 Always done conventional or close stance, never over 5 rep sets. Warm up quickly, and get 2 top sets of 5 reps. My best 5 rep set is 625 done totally raw. Do these with straps if you can&apos;t hold on, and use a belt if needed. I do mine totally raw, no belt, no straps. My best is 455x5 reps. 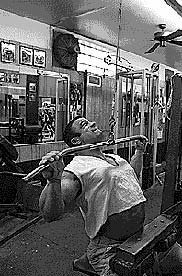 It is OK to use a little momentum--it is normal as the heavy weights are going to jerk your upper body around a bit. Make sure the weight hits the floor on the way down slightly, and make sure you row to your lower abs. 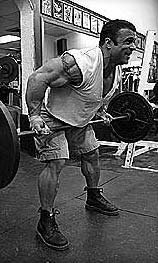 DL&apos;s and rows are the foundation for sick thickness in your entire backside. 2 sets, 5 hard reps. Unleash it. Don&apos;t believe the hype about doing these with no weight for high reps to feel it-strap some weight on and get Animal. I can do around 50 pounds strapped around me with a dipping belt for 7-9 reps, at a bodyweight of 240 with real long arms. Stretch your lats in the middle, between sets. Do 3 x 5-9 reps with weight, and one set of 10 without weight. Front grip lat pulls, done with a medium grip, for 2 x 7 reps. Heavy weights on this will give a good bicep pump and not much else. Pull with your elbows on all back exercises. I can do most stacks for 7 reps without too much trouble. Dumbbell rows, or chain saw pulls. Support yourself on a bench, and do heavy weights, 2 x 7 reps. My best is 175 x 7... Never found any heavier dumbbells around here at the gyms. 3 x 15 reps, with weight. Good pump movement here... You should be ready to puke by now. Traps are part of your back. Use straps if you must--full range of motion here. Try to touch your ears here, 2 x 20 reps. Finish with ab work, with weight. Your choice of exercises, and 4 x 25 reps... Stretch in between sets. Do this workout only once per week and you will be on your way to a killer back. Printable Log Of This Back Routine.